Using E4D Planscan and 3Shape trios digital technology is part our state-of-the-art practice. Dr. Zachary E. Linhart is proud to present the new E4D Planscan scanner to the office, and the 3Shape Trios. These two intra-oral scanners, along with our E4D porcelain mill, allow us to fabricate Crowns, Veneers, Inlays, and Onlays in about 2 hours! In addition, the scanning negates the need for goopy, foul tasting impresion materials for both restorative dentistry and Invisalign®! Traditionally, these procedures would take two visits with a temporary being worn in between. Now, we can scan, design, mill, and insert these restorations in a single visit, at your convenience. Similar to CEREC, which is a different in office system, E4D can make restorations out of multiple materials, including ceramic, porcelain, composite, and zirconia. The tooth is prepared for the necessary restoration, whether it is a crown, inlay, or onlay, by Dr. Linhart. The prepared tooth is scanned inside your mouth with a camera that uses lasers to build a 3-dimensional model of the tooth. The restoration (crown, inlay, onlay) is designed digitally using the E4D’s revolutionary software. Every intricate detail can be customized to make the restoration a perfect fit. The restoration is adjusted and cemented onto the prepared tooth. 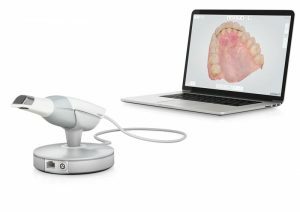 Here is another video showing how we can scan an entire mouth with the 3Shape Trios. These scans can be used for Invisalign®, for bite analysis, to track gum recession and tooth wear, to make grinding appliances, and much more! This can all be accomplished in a single visit, making the whole procedure easier, and saving precious time. E-mail or call us if you have any questions about this revolutionary CAD/CAM technology!